Last year on Black Friday, at-home DNA test kits were the single hottest product of the season — and we fully expect the same to be true for Black Friday 2018. Not only are these awesome little DNA test kits super easy to use and beyond eye-opening once you get the results, the most popular tests out there also happen to be on sale at their lowest prices ever! 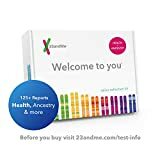 The $200 23andMe DNA Test – Health + Ancestry Personal Genetic Service is down to $99 for Black Friday 2018, the $100 AncestryDNA: Genetic Testing Ethnicity is discounted to $59, and already affordable $75 MyHeritage DNA Test Kit – Ancestry & Ethnicity Genetic Testing is just $49. All these deals are good while supplies last and they’re all sellout risks, so definitely grab a few while you still can. Oh, and if you have a pup you should definitely get this discounted Wisdom Panel 3.0 Breed Identification DNA Test Kit for only $49.99!